Night falls over Rae Lakes. 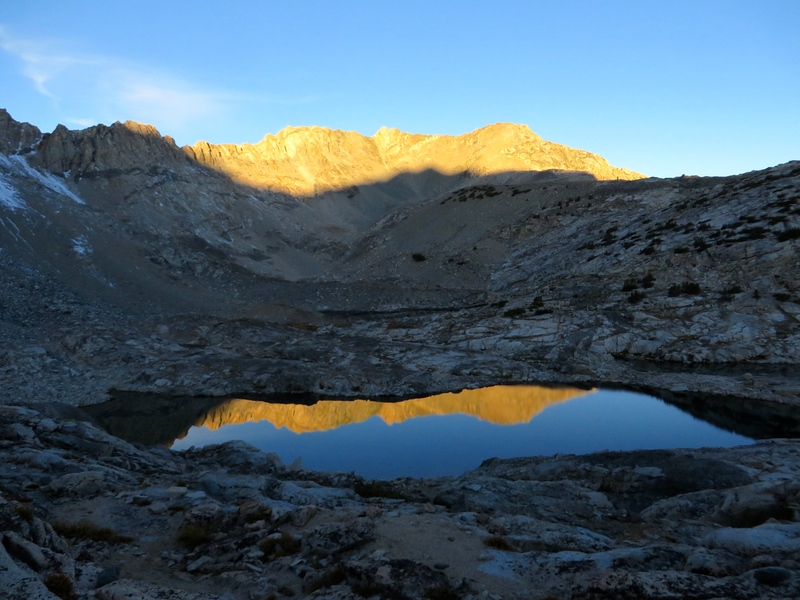 The sun is setting over Rae Lakes. And so it does earlier and earlier every day. The sun goes down around 6.30 pm these autumn days. I’m checking the area left and right of the trail for a good flat spot to pitch my tent. In the dark, it’s harder to do this, even with my Petzl headlamp blasting on full force. But I always manage to find a good spot. I’m the only hiker around tonight, which is luxurious, having all that space for just me and my cute little shelter. An hour earlier, I cooked dinner. I don’t maintain a fancy kitchen, all I need to do is burn my stove to boil some water, adding it to a ziplock bag full of freeze dried goods, et voila, a 5 star meal is ready. I always cook more water for my daily treat: hot chocolate. So good. I love this moment of the day, where I can warm my hands to my mug and as I swallow the hot liquid, I feel it entering and warming my chest. After dinner I always try to hike another 3 miles, so I won’t attract any animals to my tent. But the food I brought with me is not enough. Ever since I decided to hike 212 miles on only one resupply, I put myself on ration. Because of this section’s high(er) altitude, my body needs more energy to keep performing. It is by far not enough to keep me going. At night, I can’t sleep of the ubiquitous hunger. It doesn’t go away. I want to eat the whole content of the bear canister right now but that’s impossible. I still have 5 days of hiking left until Kennedy Meadows. My stomach hurts so much. Sleep doesn’t come. I start to worry. What if I can’t make it all the way to the next resupply point? I’m in the middle of nowhere. I push the worrying thoughts away. But they keep coming back. I check my watch. It has a little build-in light. 8 pm. 9.34 pm. 10.19 pm. To distract myself from the hunger pains, I listen to one of the 1 hour long Radiolab podcasts. Miraculously, it does the trick. I dose off. My body relaxes. Even my legs, which always feel cramped after a day of hiking, are starting to relax. My eyes getting heavier every second. The stars in the sky, which I can see through the mesh of the tent, fade away. I breathe slower. Sleep arrives. That night, I dream of drinking out of a giant chocolate fountain, and bathing in a sea of spaghetti sauce. The alarm clock interrupts my sweet dreams roughly. 4.30 am. Time to wake up, time to hike! My breakfast: 2 Snicker bars. Good for 500 calories. But not enough to silence my stomach. Today, I’m setting out a little earlier than usual, because there happens to be two mountain passes on the menu. The first one, Glen Pass, is 11.926 feet in elevation. 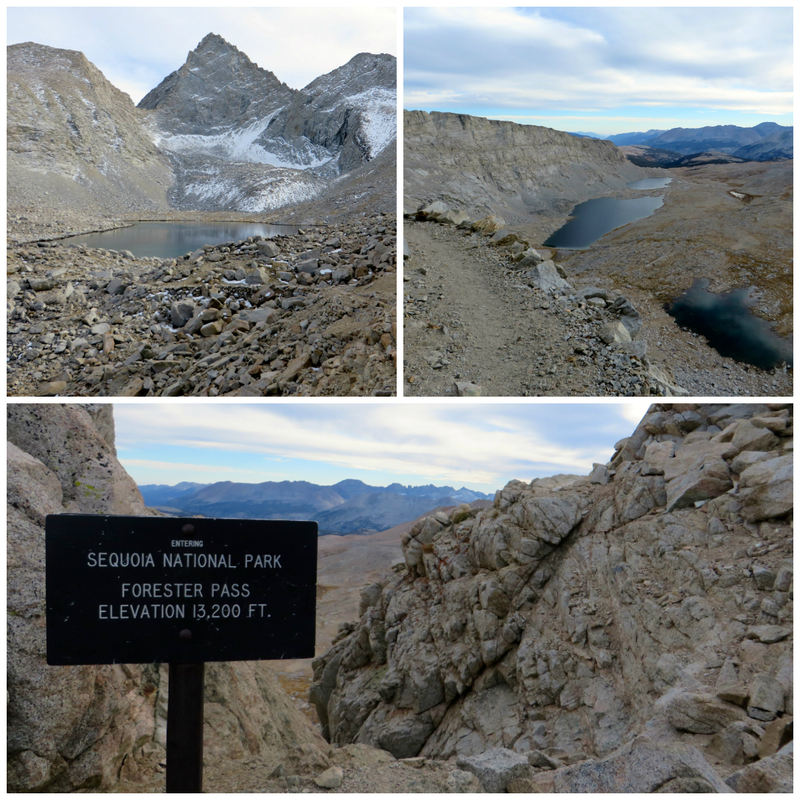 The second one, marks the highest point on the whole Pacific Crest Trail, at 13.200 feet. Not an easy day, by all means. I hike out in a pitch black morning. The air is cool. The trail loops around Rae Lakes, and then up towards Glen Pass. Sunrise on the approach to Glen Pass. But after a half hour, I collapse. I’m so goddamn hungry. I feel dizzy. And weak. I choose a rock to sit on. And take a few more bars out of my canister. I HAVE to eat. Otherwise I don’t see myself climbing up the pass. I try to regain control over my breathing. It takes me a half hour to get up and hike. My average speed drops to 1 mph. After a long time, and a lot of short breaks, I manage to reach the top of Glen Pass. The views, both north and south, are stunning. I climbed the first of two passes! The trail descends, and I’m racing down to make up some time. My mind starts racing too. I worry. I worry a lot. 5 days of hiking left and I realize that I didn’t bring enough food with me for this demanding stretch. I beat myself up in my head. Why didn’t I bring more food? I’m halfway the section. I can’t go back. I have to keep moving. But how? Right in between Glen Pass and Forester Pass, the trail crosses a side trail. And right at this crossing, I suddenly meet another hiker. I haven’t seen a single soul in the last few days so I’m very delighted to see a handsome guy coming my way, who is doing a 2-day loop by himself. We start talking and then he complains about his backpack, about the weight he’s been carrying. He brought too much food. My heart skips a beat when I hear this. Too much food? We have a win/win situation here! I tell him that I brought too little, and that I have been worrying sick about it. He opens his pack and gives me everything he has: risotto, oatmeal, salmon, power bars, chocolate. What even is this, I think. Who is this guy? Why is he here? The trail provides, a profound proverb on the Pacific Crest Trail. And it truly does today. Thank you handsome hiker for your generosity! Thank you trail for providing everything I need. Extra calories! I still can’t believe it and have to blink my eyes a few times. 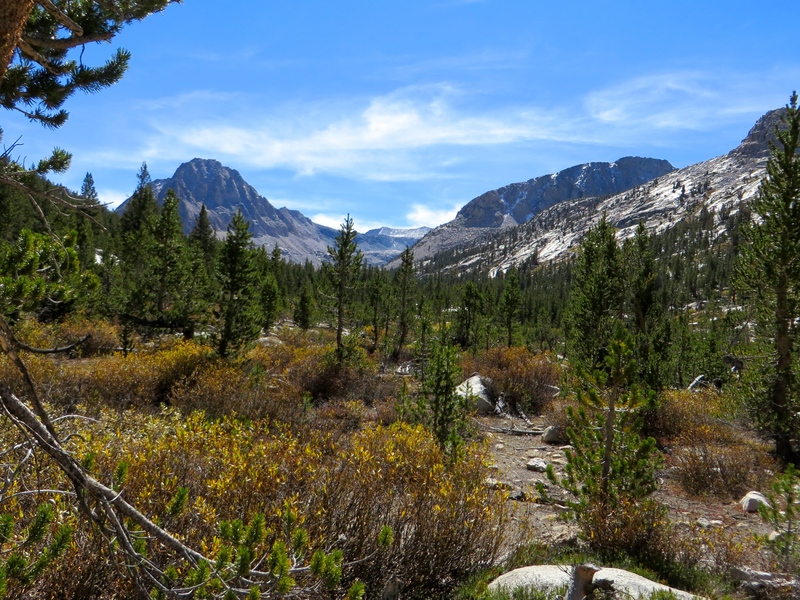 Hiking up Forester Pass isn’t easy but what a beautiful day it is, out here in King’s Canyon. The approach through the canyon leading up to Forester Pass, as seen in the distance. 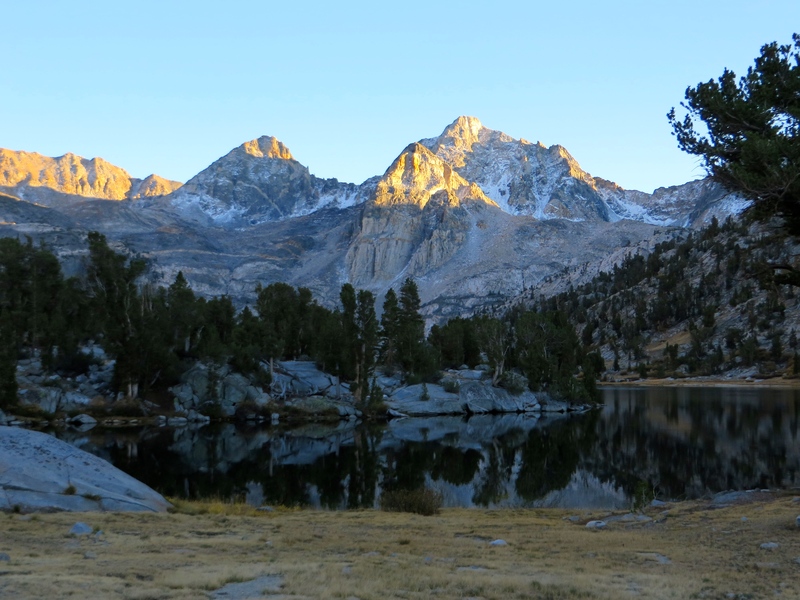 When I reach the highest point on the Pacific Crest Trail, I’m overwhelmed by strong emotions. I start to cry. I did it. Standing at 13.200 feet with even more stunning views than on Glen Pass. It’s just amazing. All the high passes of the entire Pacific Crest Trail are now behind me. 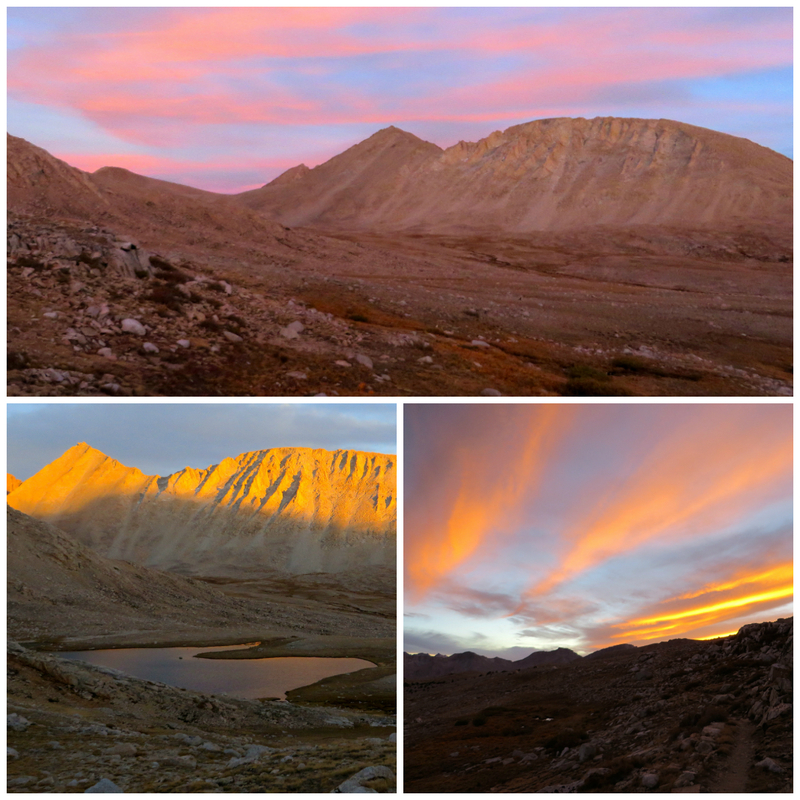 Hiking down Forester in the late afternoon, and I am given another present: an amazing sunset. The colors of the sky are changing each second. So, so beautiful. Sequoia skies colors purple, pink and red. That night, after devouring an exquisite meal of risotto and salmon, I fall asleep with a happy and full stomach. Your photos are stunning! Great read too! wow that must have been scary and tough, hiking while hungry is impossible. luckily you have an angel on your shoulder.